The blazing circus tent fire that has become the upcoming Nina Simone biopic will hopefully go down in history for teaching us a number of valuable lessons, like don’t put anyone in anything that might even resemble blackface. Perhaps the clearest takeaway, however, is the importance of those of us who are not straight white men being able to tell our own stories on our terms. BuzzFeed’s Kate Aurthur did a deep dive into drama behind Nina, speaking extensively with the film’s director Cynthia Mort and other players including producer Barnaby Thompson and BET founder Robert L. Johnson. “How ‘Nina’ Became A Disaster Movie” makes it clear that the film’s creators all miss the point by varying degrees. 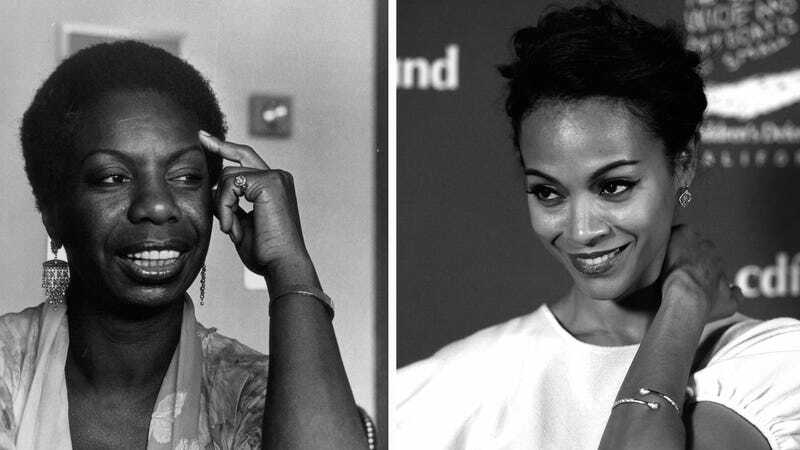 The article looks back at Mort’s love affair with Nina Simone, which began when she was young and led to a clever hustle that allowed her to spend the day with Simone on the set of a photo shoot. Mort seems well-meaning—she so deeply believes that she understands the issues at play here—but her actions and words effectively negate all this. I don’t think anyone has ever doubted Mort’s love for Simone or passion for the project, but this fiasco proves, as in many cases, that love is simply not enough. Pulling out your credentials as feminist in an attempt to prove that you have a clear understanding of the politics and issues surrounding all marginalized people is a very White Feminist thing to do. Being a feminist is great, but that alone does not make someone qualified to tell the story of a black woman who had a very nuanced relationship with her blackness. Further, awareness does not necessarily mean actual knowledge nor does awareness translate into the ability to do what’s right. Using either of those examples proves that Mort doesn’t actually understand the issue. The whole point is that white people don’t have the same history as it relates to their color and features so, no, putting a prosthetic nose on Nicole Kidman is necessarily not going to be the same as putting it on Zoe Saldana. What I also find rather amusing is Mort’s use of “but.” In this interview, she acts like it’s one thing or another: heeding the importance of race in this very story, or simply not—as if the decision is a coin flip rather than a dilemma with a right and a wrong choice. The issue of skin color is almost always relevant to some degree in stories about black lives. In particular, skin color was very important to who Nina Simone was. It’s easy to see that Mort’s utter inability to grasp colorism and racism as they related to Simone’s existence severely impaired her ability to tell the story, and there is no way around that. Like Mort, BET founder Robert Johnson is trying to do damage control in this piece, and he comes off sounding relatively ignorant, like someone who is willing to distort history and what I have to believe is a real understanding of the racial politics of America in order to save his film and make a profit. Of course, nobody is saying this. To believe that the arguments being made can be summed up as Zoe Saldana isn’t black enough is to believe a long list of dumb things, starting with the idea that a person’s level of blackness is proportionate to the hue of their skin, and that there are designated levels of blackness in the first place. The argument he is ignoring is one against colorism, the process in which light-skinned actors are favored literally no matter what the story, the exact process that black people in Hollywood have been aware of as long as Hollywood has existed. Johnson went on to further fan the flames by bringing up the KKK, as absurd arguments about race in 2016 are not complete without a misguided comparison to slavery or lynching. This is so deeply stupid and completely irrelevant to Nina that it would be hurtful it wasn’t so inane. If Thompson can only understand the idea of an issue being political as relating specifically to the government or politicians, it is safe to say that he is entirely unequipped to have anything to do with telling a story like Nina Simone’s. There you have it; these are the people tasked with putting Nina Simone’s life onscreen and, frankly, it’s no wonder they struggled. Zoe Saldana and David Oyelowo are refusing to give interviews about the film, which is both surprising and not. If Zoe Saldana was so confident that she was up to the task of playing Simone, then, criticism aside, why not stand by it? My guess is because they know the film doesn’t redeem itself in the face of all the drama, that Saldana’s performance immediately negates the inherently flawed argument that she was the best possible actress for the role. Aurthur notes that BuzzFeed was denied repeated efforts to view the film before the interview. I was happy to see that the story confronted the economics of casting Zoe Saldana, because it’s an important part of the whole mess. Mort admits that the movie needed “star power” to get funding, and we learn that Mary J. Blige was originally cast as Simone before dropping out due to scheduling issues. While I’m sure that’s true, Ta-Nehisi Coates argued the flip side: if the film can’t respect its subject, then perhaps it shouldn’t be made at all. Thompson, on the other hand, was adamant that bankability wasn’t a factor in casting Zoe Saldana. Nina, he said, is a small indie movie and wasn’t driven by commercial incentives. This can’t entirely be true: most people are making movies, at least in part, to make money. But fine, let’s believe him that a film of this size didn’t necessarily need some huge blockbuster name to be successful. Why not cast anyone else? Viola Davis is more than a big enough name to carry a $7 million film, as are any of the black actresses or singers who’ve come to prominence in the decade since the project got started—one that’s admittedly changed the landscape a lot for women of color, mostly on TV. Hell, even Fantasia Barrino probably has enough name recognition to anchor a film at this level. And no matter what, the star power argument is plausible in general but weak as it relates to Zoe Saldana. Yes, she has starred in a number of huge films—Avatar, Star Trek, Guardians of the Galaxy—but it’s more than a stretch to suggest that the success of those films stemmed from her presence. She gives great performances in them, but those movies would have been huge hits almost regardless of who starred. So goes just another tone-deaf casting decision in a long line of them. I have little hope that Hollywood is truly learning its lesson from missteps like Nina, but you never know. If nothing else, the film has helped to spark discussions about colorism and the scant roles for women of color in film. But Aurthur’s piece makes it obvious that the real problem isn’t simply that Mort and most of the people behind the film are white, but that they really don’t get who Nina Simone was, what was important to her, and what determined her life trajectory. They have some empathy, they know a vaguely correct vocabulary, and they thought that was enough. The fact is, a different team of people behind this film would have certainly produced a very different outcome, and that team should have included a few people who look like Nina Simone. What’s most disappointing is that right now, we could be excited about the release of a Nina Simone biopic instead of lamenting about yet another Hollywood failure that could easily have been fixed with a bit of humility and basic racial awareness, and by simply opening the door a little wider.